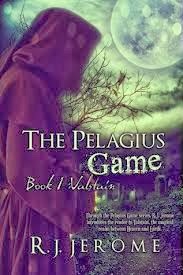 “Valstain,” the first book in R.J. Jerome's The Pelagius Game series, is a fantasy fiction book, with lots of religious aspects, about an enchanting realm between Heaven and Earth. The book revolves around Timothy Anderon as he tries to reveal corruption within the Order, a secret religious society that prepares warriors for battling evil. The world building in this fantasy book is incredible. R. J. Jerome has a knack for building a rich, imaginative world that is detailed yet also approachable. The characters, especially Tim, are fun to follow and easy to root for (or against, in some cases); their actions and dialogue feel realistic. The plot is the highlight of the book. It has slower parts to let you appreciate the world, but lots of action and some surprising twists that will keep you on the edge of your seat. Since this is the first book of the series, the book does leave room for the story to continue. Overall, this is a fresh, engaging fantasy book that will have fantasy fans of all ages hungry for more.